Scandinavian design espouses a few simple principles – simplicity, functionality and style. Sure, when we think of Nordic design we picture chilly climes, dramatic geography and Vikings, but interior design is one of the things that Scandinavia does best. Due to its popularity, this ubiquitous aesthetic not only survives in northern Europe, but has spanned the globe and influenced a range of different architectural and interior designs. 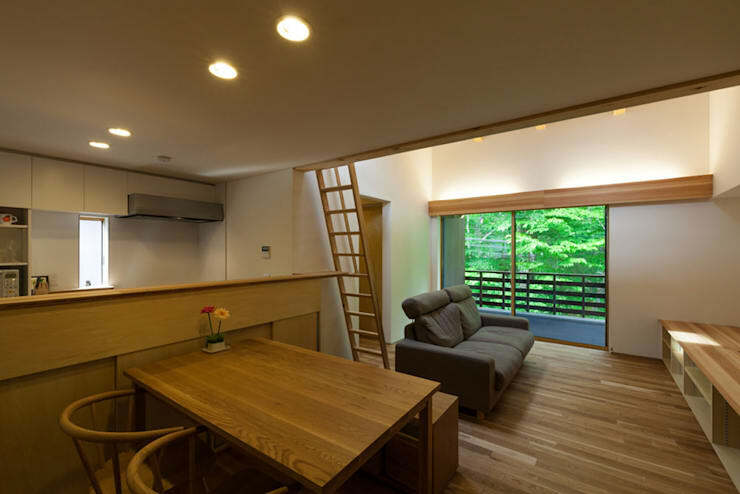 Today’s feature takes us to the small resort town of Karuizawa in Nagano Prefecture where a dwelling has been constructed as a relaxing and functional weekend/holiday home for a husband and wife. Designed by Koufusha Architects Studio and comprising 79.76m2, the abode features a Scandinavian ambience, plenty of natural materials, as well as a tranquil interior scheme. Would you like to take a tour of this interesting domestic escape? Check out the pictures below and glean a little inspiration for your own home! 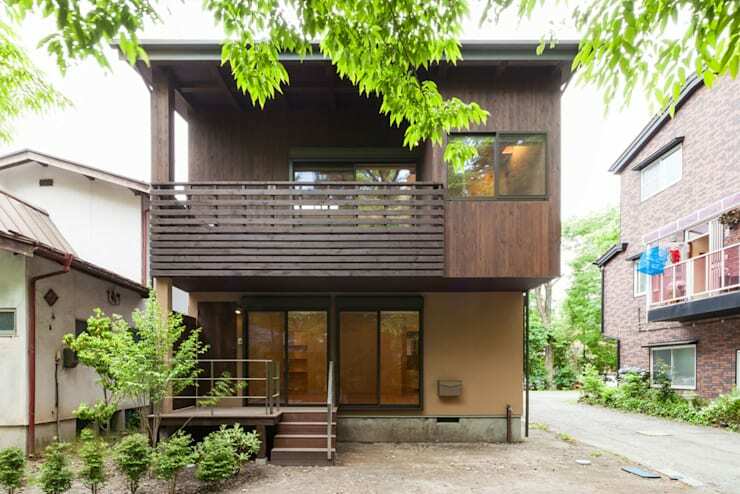 The first image of this home provides us with a good idea of the exterior façade and its appearance. 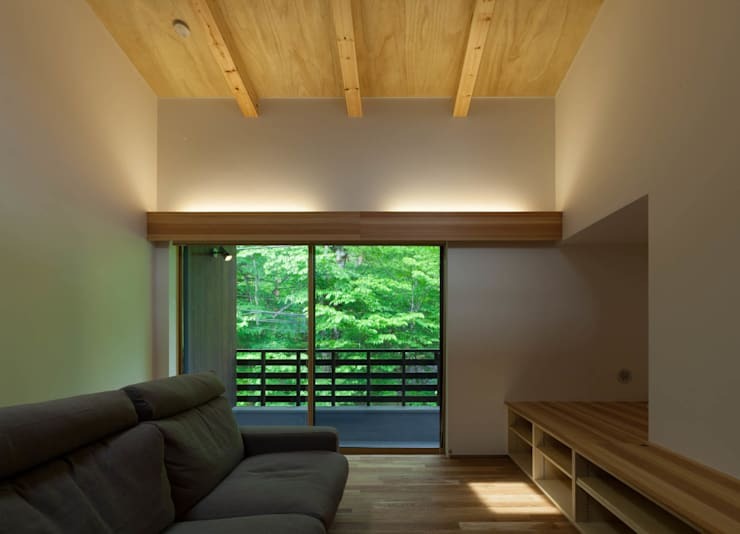 Luxuriously clad in local Japanese larch, the architects have ensure the home radiates a sense of Nordic luxury, heavily influenced by its rural Japanese surrounds. Upon approach to the home, we see the simple front staircase with a small deck, which could be utilised as a place to sit during the warmer months, or with a hot drink while watching the snow. Upstairs there is a large terrace with timber balustrade, providing views of the surrounding neighbourhood, and the ideal area for socialising and gathering. Inside the residence we are presented with a gorgeously simple yet alluring aesthetic. Practical and uncomplicated, the décor boasts a place for the couple or their family to gather, and a small dining area for four of more. The room’s colour scheme is very much matched to its usage of natural materials, including the local larch and other organic touches. Timber is employed extensively, which contributes to the sense of welcoming warmth throughout. A lofty space thanks to the commodious ceiling height, this room connects itself to the lush landscape beyond by way of sliding glass doors. Moving closer within the room, we are also able to see that the media centre and entertainment cabinet is actually built into the room’s shape and form, adding practicality and cohesion between the architecture and the furniture. 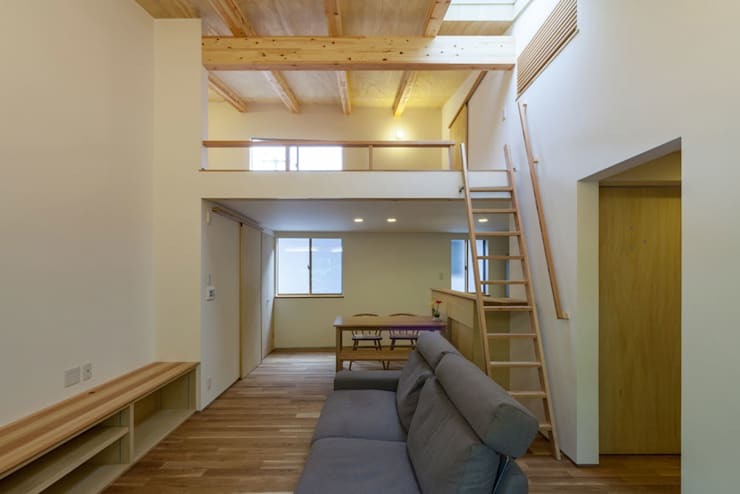 To make the most of the large ceiling space, a small mezzanine has been built. 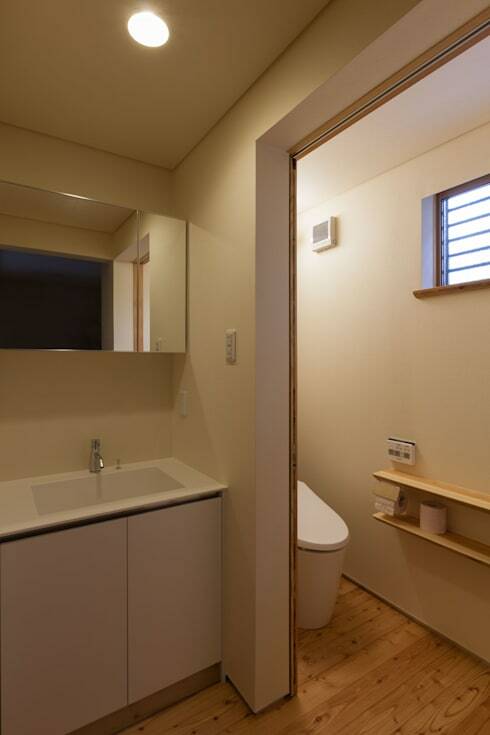 This area is a multi-purpose area that accommodates a range of different uses. 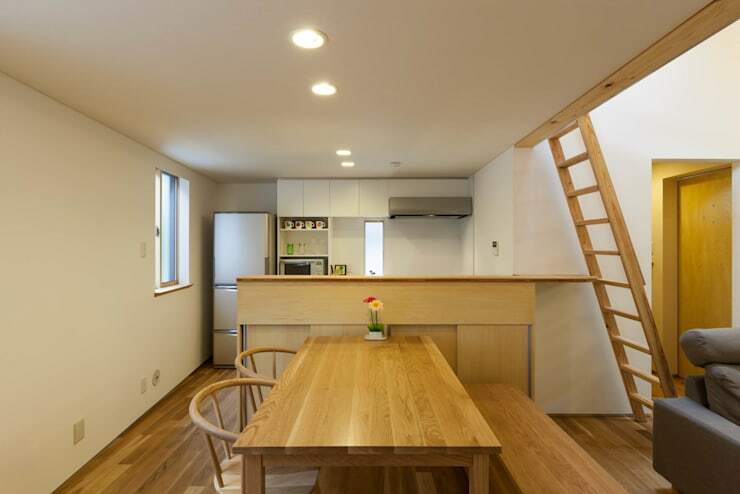 From relaxing and resting, to storing domestic essentials, this area is perfectly located with a ladder for easy access. As we mentioned earlier the dining area has enough room for at least four individuals. Since it is a couple that will be using the space there was no need for a large entertaining room, and yet this cosy nook still provides a sumptuous area to host a dinner or get-together. Inside the kitchen technology has been utilised and embraced. A true cook’s kitchen the worktops are stainless steel, which is perfect for low-maintenance cleaning and functionality. Joinery is also practical and built for its main purpose, adding a utilitarian and rather austere ambience. 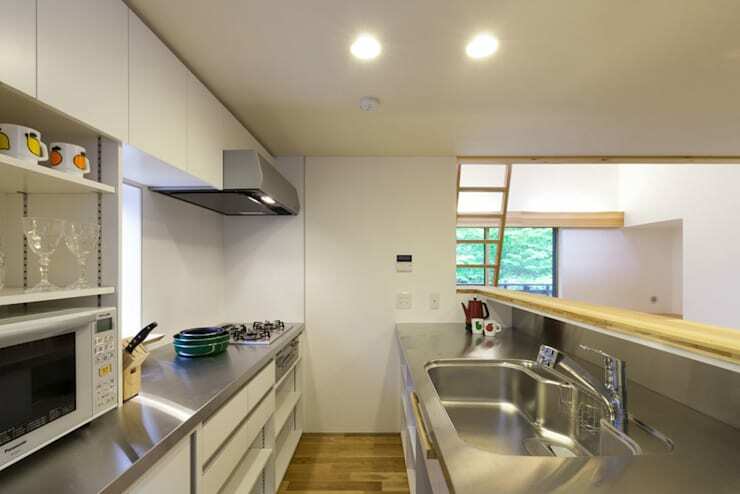 However, there is also a sense that this is a friendly abode, welcoming and perfect for individuals to come and visit, for food to be cooked, and memories be made. Before we end our tour, we better take a quick peek inside the bathroom. Before we end our tour, we better take a quick peek inside the bathroom. Simple and minimalist, the earthy and warm colour scheme is continued. Once again the joinery is unfussy and sensible, with modern fixtures and a usable aesthetic. The bath area is definitely a standout feature for this abode. 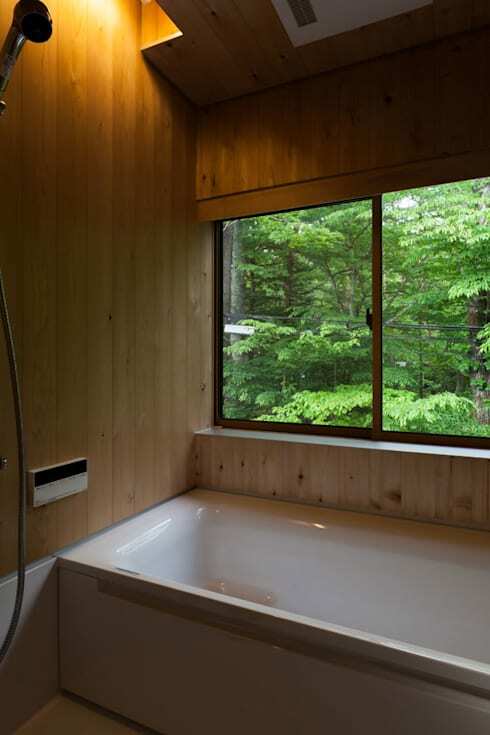 With gorgeous views over the forest beyond, this is a serene space to rest one’s body and revive one’s soul! Would you like to spend the weekend here?